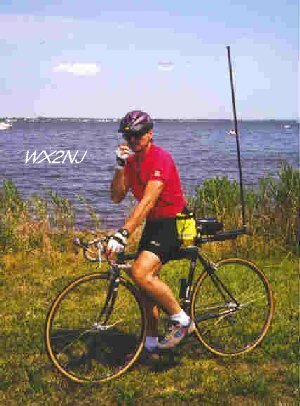 As a cyclist and amateur radio operator, I wanted to find a reliable, good performing bicycle antenna that did not depend on the metal frame of the bike as a groundplane. 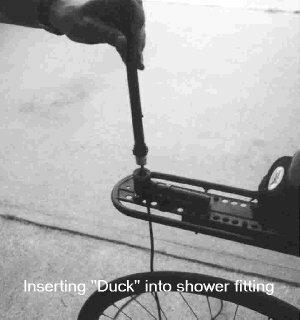 This is especially important for those who ride carbon fiber bikes. After exhaustive experimentation, I came to the conclusion that the J-Pole was the antenna to do the job. Trimming the J-Pole to work inside the CPVC pipe (because of capacitive effects) was a challenge and mounting it was another story. 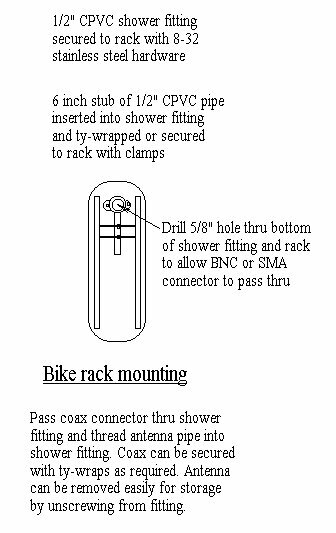 Taping or ty-wrapping a twin-lead J-Pole to a fiberglass pole may work , but it looks miserable and besides, how many cyclists enjoy riding with a bright orange or yellow fiberglass pole on their frame. The Jurassic Duck uses tough CPVC pipe which makes the construction durable, weather tight, lightweight, easily removable, inexpensive, and may be painted to any color. A flat black finish (don't use metallic paint) makes the duck look truly "jurassic" but at the same time, blending in with the surroundings (probably because most road surfaces are black). 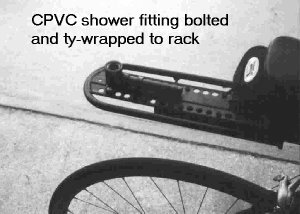 Many have commented that PVC pipe is easier to use and more readily available. The problem with PVC is that it is like a rubber band when it gets hot and can become deformed. The CPVC is made for hot water and tolerates the sun better. If you make one of these units from scratch, it will cost you about $10. 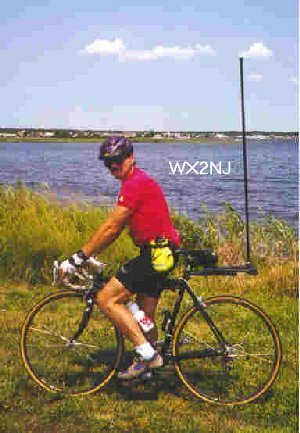 I don't think you can get a better performing bicycle antenna for less. 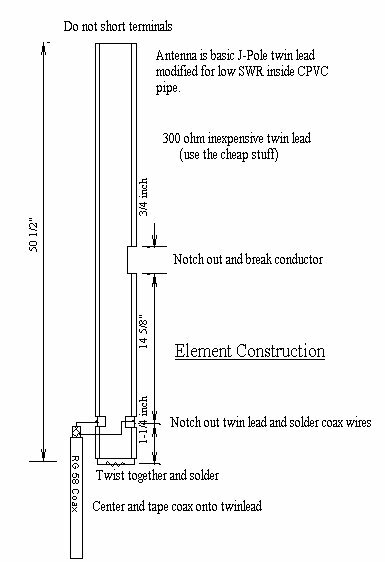 Trim a 50-1/2 inch length of 300 ohm twin-lead as shown on the diagram. The two conductors at the base are soldered together. The coax center conductor is soldered to the long stub and the shield is soldered to the short stub. The coax is shown to the side for clarity. 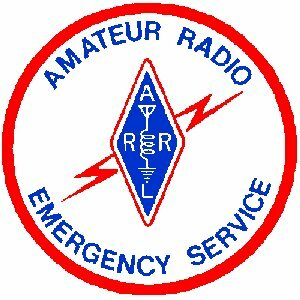 It should be taped to the center of the coax after soldering. 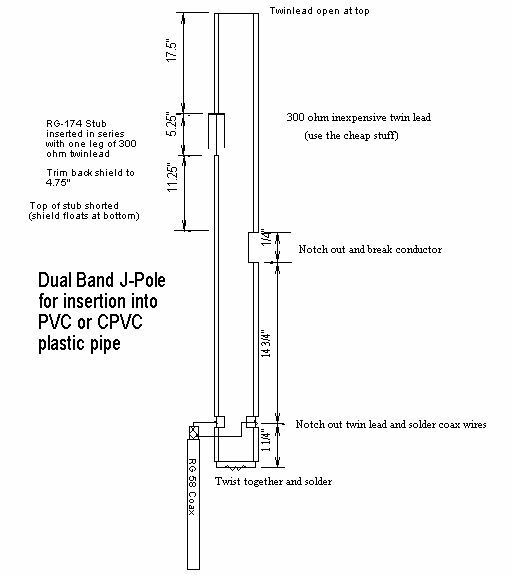 The length of the CPVC pipe is not critical. It just needs to enclose the twin lead J-Pole. The pipe is very stable as you ride because it is located behind you and is blocked by most of the wind. The hole through the shower fitting needs to be large enough to fit the connector of your choice. Obviously, a PL-259 will not fit through the fitting and allow you to remove the antenna. I've mounted these antennas on bike racks which extend from the seat post (Delta brand) and regular mountain or touring racks and have had no problems with antenna stability.